Faced with a hike in gasoline prices early in 2017, Mexicans are being encouraged to switch to natural gas, an option that would allow fuel savings in excess of 50% and ranging up to 70%. As is typical of an emerging natural gas vehicle market, the lack of infrastructure is a dominant challenge and one which will reportedly be addressed over the next few years. In Mexico City (Oct. 2015) the Secretary of Energy, Pedro Joaquín Coldwell presented the five-year Expansion Plan for the Integrated Natural Gas Transportation and Storage System 2015-2019, which at that time foresaw the construction of 12 gas pipelines representing more than five thousand additional kilometers added to the existing infrastructure and near 10 billion dollars of investment. At the same time, Mexico is transitioning to an open market in the natural gas sector, creating an environment for market competition. The 2020 goal of Mexico’s Energy Secretariat (SENER) is three million natural gas vehicles (NGV) operating in the Republic. That is a massive target given the Mexican Natural Gas Association (AMGN) estimates there are only 8,000 NGVs at present and 190 refueling stations. With the awakening of the NGV market in Mexico, that latter figure is expected to quickly climb to more than 1,000 stations. The current NGV figures are not surprising given pipeline infrastructure currently only reaches 7% of the population (AMGN). The economic argument will be the major factor for consideration of vehicle owners. As reported by La Política Online, the price of natural gas in Monterrey is 8.00 per liter (USD 0.37) against the 18.19 pesos (USD 0.83) that premium gasoline costs. 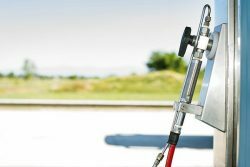 In Santiago de Querétaro, gas supplier Natgas offers a conversion financing model whereby the cost of conversion can be paid as a component of the Compressed Natural Gas (CNG) fuel price. Even with the repayment, the cost is still lower than the cost of regular gasoline. Sebastián Mantilla, commercial director of consultancy firm Score-Research reportedly predicts 2017 will explode the natural gas vehicle business because people will be interested in cheaper and cleaner fuel. A commitment from the transportation sector awaits a clear commitment to invest in CNG stations. There are currently stations in Puebla, Mexico City, Queretaro, Guadalajara, San Luis Potosi, Michoacan, Poza Rica, Veracruz and Monterrey. New stations are already underway for Monterrey, Mexico City, Toluca, San Luis Potosí, Aguascalientes and Celaya. The article says companies such as Neomexicana (a subsidiary of Grupo Diavaz), Natgas, Gas Natural Fenosa, Gas Natural de Juárez, Alternos Sustentables Fuels, Grupo Transregio, Grupo Martínez García, Grupo Energéticas and Gazel (Colombia) have outlined strategies for either entering or expanding their presence in Mexico’s NGV fuel market. In addition, companies such as ISC are entering into the CNG conversion market. ISC uses sequential injection equipment from OMVL, a Westport Fuel Systems company.